This last week, I lead my kinders in drawing castles. I adapted my original drawing instructions (see below) by adding extra towers to each side. 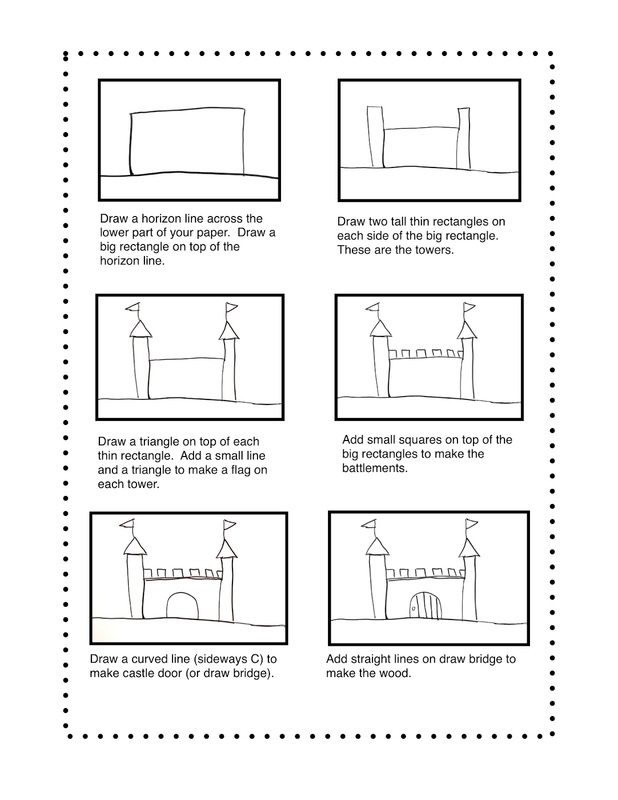 I demonstrated how to draw stones and bricks on the castle. The children loved it! Sally I used your castle lesson in my PreK. We do a whole unit on castles. You would be amazed at what a great job they did when I drew the castle on the board and they copied what I did step by step on their papers! Thanks for the inspiration! Susan, I first did this drawing lesson with four year olds and it is stunning how well they do. I was just telling my assistant that I think it is one of the best drawings for a four year old. So glad you did it! I would love any articles and ideas to enhance real and imagination into my classroom.